Preheat oven to 200°C/ 392°F. Finely chop onion, garlic, and thyme leaves. Peel carrot and cut into fine dice. Cut celery into fine dice. Heat some olive oil and sear ground lamb for approx. 2 – 3 min., breaking it up with a cooking spoon. Add onion, garlic, thyme, carrots, and celery and fry for approx. 5 – 8 min. Season well with salt and pepper. Add tomato paste and fry for approx. 1 – 2 min. Then, add flour and stir constantly for approx. 2 – 3 min. Add chicken stock and let simmer over medium heat for approx. 10 – 12 min. 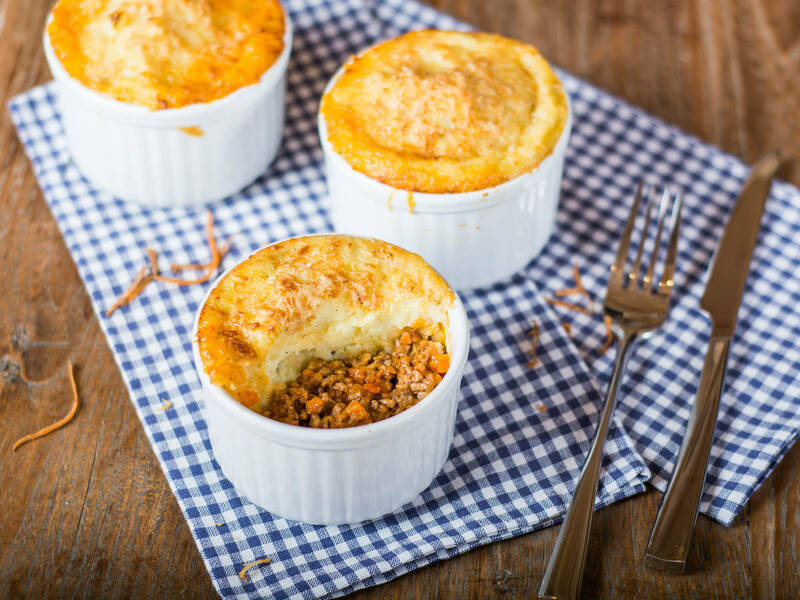 Place meat into a large ovenproof dish and spread mashed potatoes evenly on top. Top with parmesan and bake in preheated oven at 200°C/ 390°F for approx. 20 – 25 min. until golden.